Practicing yoga with a group of friends, teammates and coworkers is a fantastic way to achieve fitness together. Yoga classes at Be Fit are customized and adapted to meet specific requirements and needs and help you achieve your fitness goals. Yoga can be a fun way to celebrate, maintain competitiveness in sports, to morale building. It helps individuals develop more coordination and flexibility. The length of the class, the intensity level at which you exercise and the focus of the practice can be determined by the participants. There are numerous benefits of yoga practice for friends, families and groups to enjoy. Be Fit offers participants the opportunity to experience yoga practice in an intimate group setting. Whom you choose to bring along is completely up to you. Yoga practice can be a special one time session which is ideal for a girl’s weekend, reunion, holiday, retreat or even family get together, or it can be a weekly, ongoing practice you do in the comfort of your home. Yoga can be practiced in a studio or nearby field. Our aim is to work with our participants to provide the perfect yoga experience for you and your team. 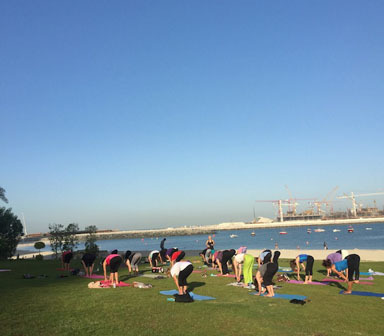 Our yoga classes are tailor made to suit various levels, including beginner, intermediate and advanced, different skill levels, interests and the goals of all participants within the group. The yoga class range in duration, and can be done at your preferred location including your home, office, studio, park, or cottage. Yoga is a deeply relaxing way of calming the nervous system by practicing through props facilitating deep release in the connective tissue. Classes at Be Fit are specially designed to address the needs of participants at all stages of their lives. The focus will be centered on breath, mantra, physical posture, and meditation paving the way for a deep connection to be born that is your true self. It will help you reconnect to the outer goddess in you and nurture the inner beauty. Our yoga classes are perfect for all levels and competencies.